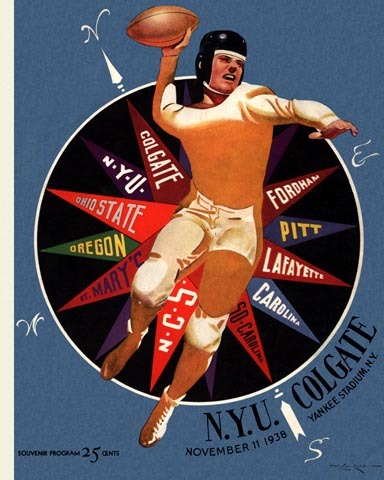 Few teams in 1938 put themselves through the ringer quite like Colgate. On their schedule were # 3 ranked Duke, # 9 ranked Holy Cross, and # 12 ranked Cornell, the cream of the then-rich Ivy crop. After narrow losses in all three of those games, and shutout wins over Columbia and Iowa, the Red Raiders petered out at the end of the year, and dropped this final match in a lackluster Yankee Stadium performance against a mediocre NYU team. Great Lon Keller cover, though.